Every December, The Bolingbrook Babbler convenes a panel of psychics to get their visions for the New Year. Last year, our psychics predicted a major flood in Bolingbrook, Barack Obama's nomination, and the Cubs' stunning collapse in the playoffs. Some so-called skeptics will say that our psychics didn't exactly predict these events. But like we said in 2007, these were our best interpretation of their visions for 2008. They did predict these events. We just had to adjust our interpretation of their visions. So without further ado, here are the best interpretations of our psychics' visions for 2009. Just remember that the actual events might be slightly different from our interpretations. Plus, you, the reader, might be able to change the future course of history with your foreknowledge. • An inch of snow will fall in the Chicago area. With city and suburban snow removal funds depleted, the snow will not be plowed. The Chicago area will fall into chaos. President Obama will be forced to call in the army to clear the roads. Southern Senators will try to stop him, saying that God never intended man to live so far north. The state senate will vote to impeach Governor Rod Blagojevich. Blagojevich will order the National Guard to arrest all state legislators. The 2nd Illinois Dental detachment, the only Illinois Guard personnel not in Iraq, will make a token effort to follow Blagojevich's orders. In Bolingbrook, 10,000 people will file to run for mayor after an Internet rumor claims that candidates don't have to live in Bolingbrook to run. Only 525 candidates will be certified. The new owners of the Chicago Cubs will promise to maintain their tradition of losing. "Do you honestly think people will love the Cubs if they win?" The new president will say. "Our research shows that people will see the Cubs regardless of their record. So we're not going to waste money on so-called good players. We're going to focus on being the most loveable losers in Major League Baseball." An oil field will be discovered under the Southside of Chicago. Though oil prices are at an all-time low, area churches will fight for their share of the revenue. During the Bolingbrook mayoral election, a group called "Residents for Roger" will run ads suggesting that Nancy Grace is a serial killer who tries to frame her victims' family members. "Don't let Roger become one of Nancy's victims." The ads will conclude. 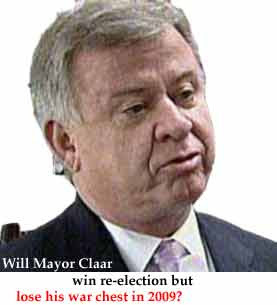 Roger Claar will win re-election, but his famous campaign war chest will be depleted. The Bears will not make it to the Super Bowl in 2009.